This is a follow-up to the previous post about our solar power backup system. Fair warning: this post contains a lot of technical jargon, but it's necessary to answer some of the questions our technical readers have. It's a challenge to satisfy a broad audience, so if this isn't your thing, we understand. In fact, Deb says her eyes glaze over at some of this. But I'm going to dig in a little on the technologies, technical aspects of how to size the system, that sort of thing. Either way, if you haven't already, I urge you to read the previous post first to get the bigger picture. Go ahead, I'll wait... Done already and want more? OK, let's go! Not long ago, my good friend Paul tried to convince me that solar power is going to ride a slope like Moore's Law did with computer chips during our illustrious technical careers. 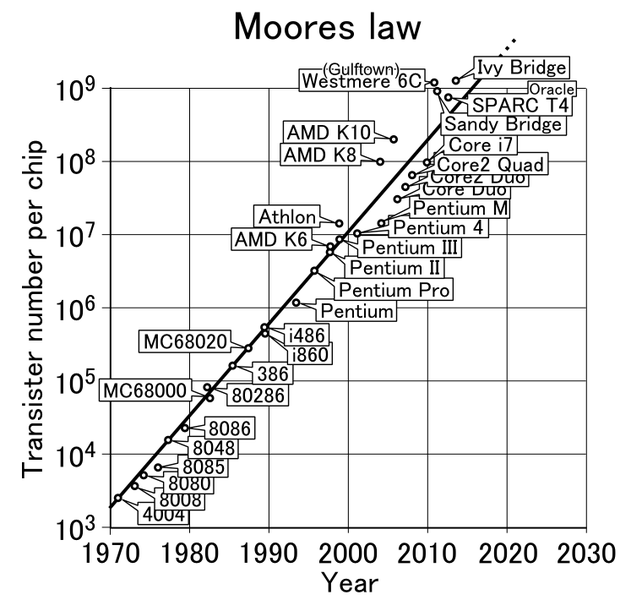 As many of you know, the law was named after the founder of Intel, Gordon Moore, who observed and predicted in 1965! that there would be a doubling of transistors in an integrated circuit every year for the next decade. A decade later, he revised it to every 2 years, and this proved to be very accurate for many decades to come. Some other big-shot at Intel muddied the message some as he pegged the doubling time at 18 months, because the transistors were getting faster as they got smaller, so performance would double in 18 months or so. But Gordon Moore was right for a long, long time. In any case, many people including Mr. Moore, predict it will end it's reign by 2025, and some are even calling it done now, in 2018. So is solar next to ride that crazy exponential curve? I really don't know but I argued, because I like to argue with Paul, that I've only seen photovoltaic efficiency go from 8% when I first heard the term “photovoltaic” in the 80's, up to around 24% for production panels today. So that's a doubling and a half in around 35 years, which doesn't say to me “this thing is really taking off!”. Efficiency in this case means how much electrical energy you get (out of the photocells) vs. how much light energy you put in (from the sun). Now research level solar cells are producing electricity at over 40% efficiency, so there is definitely hope for real gains in the future. Add to that the investment dollars that tech companies are making, and the fact that China has taken over the production of these things and driven down the cost, and the picture gets brighter all the time. Besides, what do I know? I'm the only person I know who lost money on that shining star of high tech Apple (AAPL)! Fortunately I'm not trying to solve the world's big energy problems, I'm just trying to solve our little energy problem in our little house on this little island. Because of the really unreliable power delivery here since Hurricane Maria, we need some backup power. As mentioned in the previous post, when power was knocked out on the island by Hurricane Maria, the Federal Emergency Management Agency (FEMA) and the U.S. Army Corps of Engineers (USACE) supplied big loud gasoline generators to all the key businesses on the island. And homeowners added to the noise with their own generators. I don't fault them, but frankly, the noise is a bit ugly amongst all the beauty that is Vieques. The first three items in the "Needs" list eliminated any internal combustion engine solution (think gas generator) and the last "Don't Want" item took out a wind turbine solution. Since I already had a geek preference for solar, that was the obvious direction for me. Hey, everything doesn't have to go through a strict selection process when you're retired! We also had to make some assumptions, the first of which is that we will have power some days but obviously not all of them, even in a one-week period. This affects much of the calculus and in good ways. I also don't have to or want to account for all worst case scenarios like X rainy days in a row, or power down for say, weeks at a time. That would force the system size (& cost) upward and for little real gain. This isn't life or death, it's more convenience or less convenience. The big appliances were easy to throw out. The water heater doesn't run for long but when it is running it consumes thousands of Watts! So it had no chance in this decision process, especially since cold showers are acceptable, even preferable at least some of the time. The washing machine is 500W, the refrigerator around 1000W peak, A/C at 450W. But in any case, we're assuming we can do the wash on days we have power, and that it's on long enough to keep the food in the fridge from spoiling. We haven't needed the A/C yet, but I'm sure we're going to wish we had it some hot night in July. 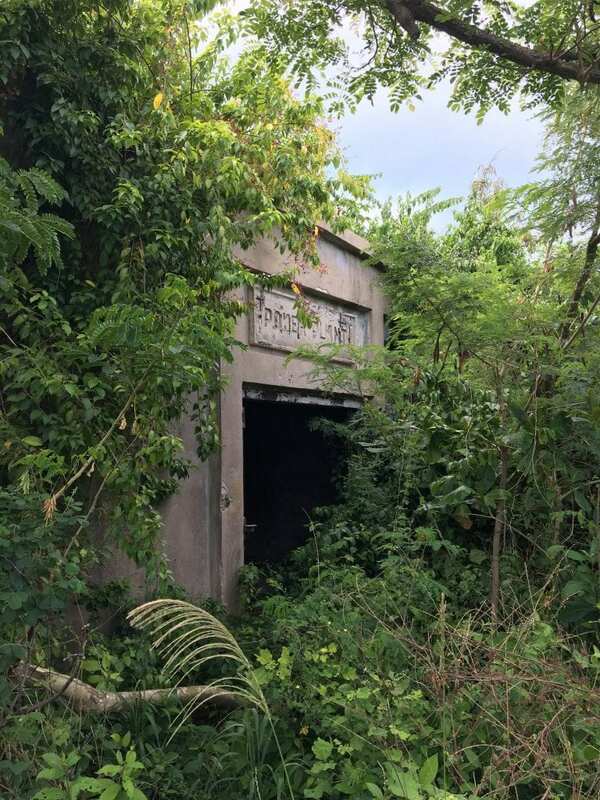 BTW, the power reliability has been a mystery, but we solved it today - we found that the power plant is a decrepit concrete shell of a building off in the jungle (see picture). Have you guys ever seen the show "Lost"? But seriously, the possibility exists that the Puerto Rico Electric Power Authority (PREPA) can't meet even the basic need of supplying power "sometimes". If they fall down on this, we'll deal with that, but for now we're in this thing for what it is. NOTE: Regarding appliance loads, I've found some web sites with tables of appliance power consumption filled with exaggerated numbers, sometimes grossly so. Guess what? They want to sell you a larger solar power system than you need! So my advice is to check the labels of each device you plan to power, or try to find the specs online if you don't own them yet. The system doesn't need to be "grid-tied”, it will never be plugged in to the power grid, which would require fancy (read: complex, expensive) controls to switch off when that power comes back, to sync up to the incoming voltage, maybe feed power back into the grid when the batteries are full, etc. etc. Remember we're only trying to solve a small problem here! The system I put together is based on an RV solar system design. It's entirely outside, with the panels on the ground and batteries on the back porch. The panels and cabling is all IP67 rated to keep water out. Even the 12V power socket I bought is designed for a boat so it has weather seals on it. The only thing that must stay dry is the inverter and its 120V loads so I just put a tupperware box over it for protection. Oh, and there's a little measurement circuit that sits on the battery but that's out of the rain too. 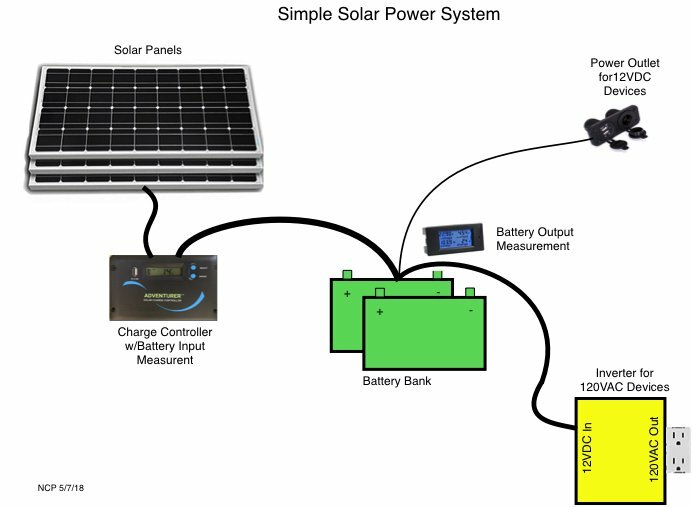 To get started, here's my drawing of our small solar power system. What I like about this system is the simplicity, and since I received the standard-issue lobotomy when I entered high-tech management a few years back, simplicity is important to me! There are four main components, the solar panels, the charge controller, the battery bank, and the output devices. 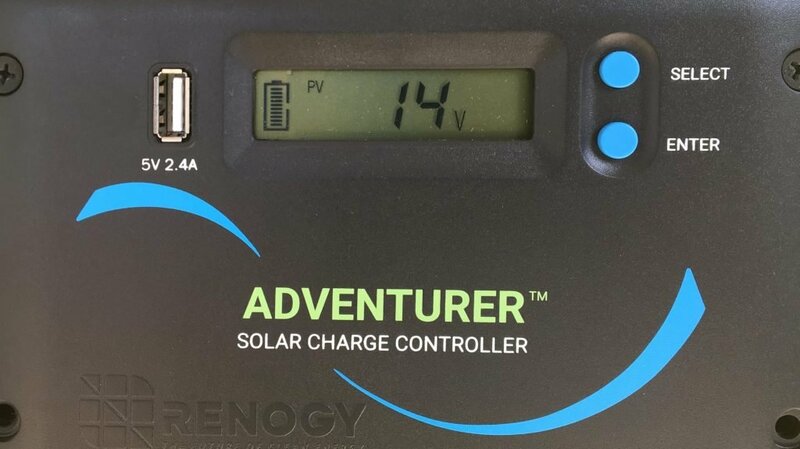 Refer to the diagram and remember this is a 12V system, you can see that the solar panels connect to the charge controller. 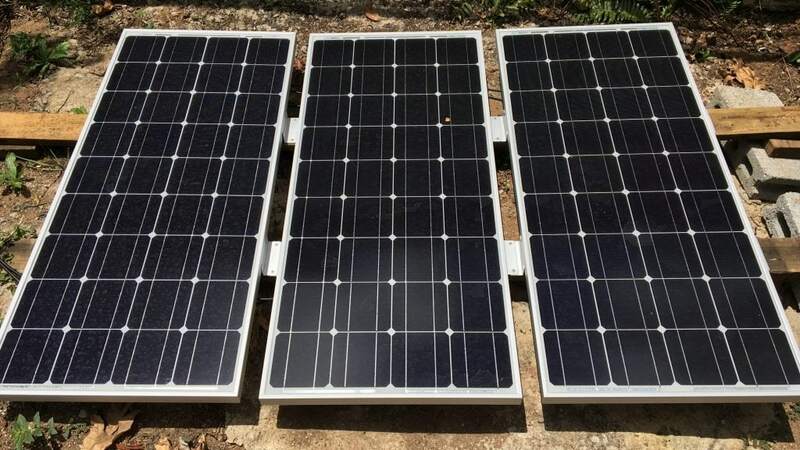 The primary job of the controller of course is to take the solar panel energy and use it to charge the batteries with the correct charge profile (constant current bulk charging, constant voltage boost charging, float charging). It also has a display to show what's happening on the charging side, and provides a USB power port to charge a phone, etc. The panels themselves supply a variable (unregulated) voltage and current, depending on what the sun is doing and what the load is doing. I've seen it range from 0V at night up to around 20V in direct sun (which would be bad for a 12V battery!). And I've seen the current go up and over 8A depending on the charge state of the batteries, but it should be able to more than double that if the batteries are low. There are other technologies, but for the consumer you can consider solar panels to come in three main types. Thin-film amorphous silicon is the least efficient at around 10%, but this is a new manufacturing technology that could grow dramatically in the coming years because the process is inherently less expensive. Polycrystalline silicon is next, running in the 13-16% range and those numbers continue to climb. Finally, Monocrystalline silicon is around 16-20% efficient. The panels I chose were monocrystalline, and around 18% efficient. We mostly only care about efficiency because it relates to panel size. With higher efficiency you get more power from the same area, or you get a smaller panel to produce the same power. In the macro picture, this would open up more places to add meaningful power generation. For us wanting this system to be moveable, the smaller the panels, the better. So for a few extra bucks, we went for the mono panels. The 12V batteries are the power source for everything else. And BTW, the order of connection matters a lot with the charge controller, because they are the power source for it as well. You never want the panels hooked up without the battery already powering the controller. Otherwise, currents can flow all willy-nilly, going places they shouldn't and burning stuff up, so I'm very careful about connecting the batteries first and disconnecting them last. 12V devices can be directly powered from the batteries even though the charge controller may put up to 14.5V on them. In my setup, this is done through the marine power socket. I have a couple of USB adaptors that plug right in so I can go straight to charging cellphones, etc. We also recently bought a cooler based on a Thermo-Electric Cooler (TEC) to cover us during a hurricane outage. This wasn't in my original calculations, it can be traded off with the fan, for example, which has a similar power draw. It draws about 50W from the 12V. 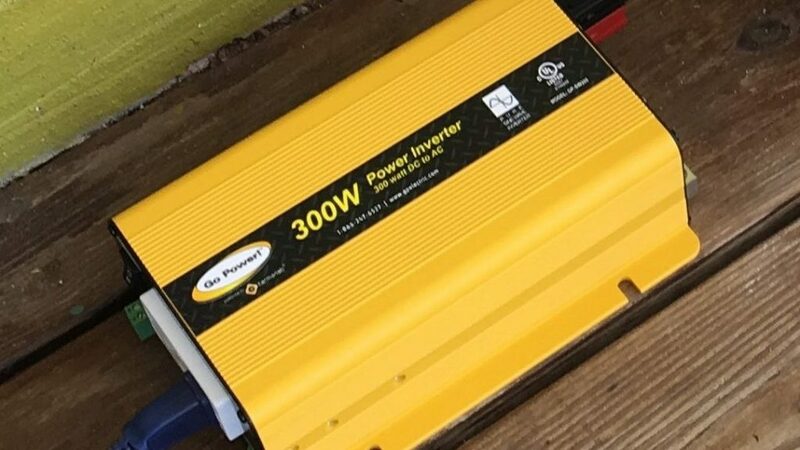 These 12V devices are great because they don't have to go through an inverter which runs at about 80-85% efficiency. Why throw away 20% of your energy if you don't have to? But the inverter is still useful for many things, basically anything that requires a normal 120VAC power plug. This is connected to the battery bank as well and it powers everything that wants to run on house power. For us, this is a fan, our larger computing device chargers (laptop, tablet), a lamp or two, that sort of thing. BTW, I paid extra for a “pure sine wave” inverter rather than a “modified sine wave” which chops up the signal in ugly ways. I'd read that some of the Apple chargers can't handle these “dirty” power inverters and who knows what else I'll want to run in the future? So I paid more and so far I'm happy with that decision. In putting together this system, I decided early on to go with the easy path. As much as my tech brain likes this stuff, I didn't want to build it all up from pieces parts and DIY everything. There is too much money investment to screw around, and the sooner we were up and running, the happier we would be. My son Matt told us he was impressed with Renogy Solar for his off-grid needs. So we went that way and found everything we needed (except the batteries) on Amazon (Prime!). But before I knew what to order, I had to do some work. * The ratings on these devices are based on the output power, not the input. In my experience, the input power on this type of device is dramatically over-padded. The output power is within 10-15% of actual. This says I need about 50 Amp-hours from my battery. I couldn't get a “real” solar power battery like a Lithium or AGM battery because of where we are, and yes, government bureaucracy (restrictions/fear about shipping batteries/blah blah blah). So I heeded the words of Theodore Roosevelt who said, “Do the best you can, with what you have, where you are”. On an island, you have marine batteries, so I bought one at the local tire store that was rated at 84 Amp-hours. But to keep these batteries healthy, you shouldn't discharge them beyond about 50%, so call that battery good for around 42 Amp-hours. I bought a second one, giving me a total of 84 available Amp-hours, and connected them in parallel. With a system efficiency around 80%, the actual need (from the table above) is about 50/0.80=62.5 Amp-hours, safely under the capacity of the two batteries. Two batteries in parallel isn't always ideal for a couple of reasons. At first connection, the one with higher voltage will charge the one with lower voltage, sometimes in spectacular fashion! So when I first cabled them together, I was very careful to get them to the same voltage before making the final connection, avoiding sparks, high current, and possible damage. Also, one battery is bound to have a slightly lower ESR (effective series resistance) than the other. During discharge, this will cause it to give up more current at first, until it discharges more than the other and comes to an equilibrium. I don't understand all this like my friend Heather the chemical engineer and former battery whisperer, but I can imagine it isn't ideally efficient. But this is also why I bought two batteries from the same store in a short period of time (because I was hauling them home on my bike at the time and they are around 75 lbs. each, I could only buy one at a time). The closer they are to each other in age, the fewer differences they have, I reckon. Two 6V batteries in series is probably a better configuration, all other things being equal, but these batteries were available to me. Next, I needed to be able to charge those batteries. 62.5 Amp-hours is 62.5*12=750 Watt-hours. To get 750 Watt-hours out of a battery, you need to put 750 Watt-hours into the battery, plus some more to account for physical losses. So let's make the math easy and round all the way up to 1000 Watt-hours needed to charge them. At 4 hours of effective sun per day (this is pretty accurate from my observations), 1000 W-hours/4 hours=250W of solar power needed. And the charge controller needs to handle 250W/12V=20 Amps. The system I found has a 30A charge controller and Qty. 3 100W panels. Without worrying too much about every last worst-case scenario, this feels pretty good. So I pulled the trigger and ordered it from Amazon, waiting impatiently for the panels, controller, and inverter to arrive. A couple weeks later, I didn't get the usual text message from our friend Carla at UPS. No, she called me and said, "Norman, you have a BIG box here and I don't think you can take it on your bicycle." Haha, of course we'd been tracking the shipment and in preparation, had rented a car for a few days (for other errands also). So we cruised down there and scooped up the goods. I was like a kid on Christmas morning! I unpacked and carefully put it all together, and then started measuring things. The geek in me was so happy! 🙂 The loads are an easy one, and I put my actual measurements in the last column of the load table above. There are a couple of observations: 1) the note at the bottom of the loads table is accurate. Product manufacturers put *very* safe numbers on their power labels so as to never risk running afoul of the regulators. I speak from experience on this point. So using the output number instead of the input number on these devices was reasonably accurate. 2) Without more work than I'm willing to do, the power draw of the 120VAC devices seems about right, with roughly an 80-85% inverter efficiency (efficiency varies with load). By that I mean that the measured numbers came from the 12V side of the inverter. To get the number at the load itself, I'd have to cut the 120VAC line and measure it directly. But it's more important for me to know what the load does to my batteries, so that's what I got. The charge controller gives me info on the charging side of the batteries and I added a nice little circuit to give me similar data on the discharge side. So on any given day, the charge controller might show me the panels producing 16-20V, and delivering 0.4-8.4Amps to the batteries, depending on the need. And if I'm running something, from this circuit I can see that current draw, as well as the current battery voltage. Both sides also give me the total energy, and to date I've put about 2 KW-hours into the batteries and taken out about 1.2KW-hours. The other day, the batteries were full and the sun was shining so I charged everything I could find. Free power, so I used it! That 1.218 KW-hours (shown in the display) from the batteries has been during the 50% of the time our power has been out in the last week. Every time it goes out, and it can easily be 2-3 times a day, I am thankful to have put this system in place. (Update: since I wrote that, power's been up for several days straight!) (Update to the Update: the power just went out again - should I laugh or cry? 🙂 ) But it keeps us in touch with the world, it keeps us in lights, and it keeps music playing in the house. We can run a fan too which is really nice in the afternoon or evening. It doesn't give us those big appliances I mentioned and we don't even have a TV, although this setup would power a smaller TV here and there if we wanted it. We don't have or need one, but it wouldn't run a 1200W hairdryer so you amateur stylists would be out of luck. It won't run the 900W coffee maker either, the 350W blender, or the 800W toaster because the inverter is only rated at 300W. But the house came with a small hand blender at 120W, so we can use that for small blending jobs. The gas stove gives us hot water when there is no power and we have a french-press for coffee. And its quite easy to toast bread on a skillet on the stove. So you see, this little system covers us really well, it's actually been a surprise to me how well it works. Our minimalist lifestyle pays off here BTW, because if we had a big house with a bunch of appliances and gadgets (garage door opener, dishwasher, microwave oven, a lot of lights, big stereo, power tools, etc.) we'd be out of luck. Or at least out of luck when the power is off. Oh, and because of that blender load, I guess frozen margaritas are only available on "power days", oh the suffering! The total cost of these things is shown below; it really adds up as you can see. But this system can still grow a little. For example, I could add another panel and more batteries if needed. It's a back and forth game. If I wanted more storage I could add a battery or two, at around $200 a pop. But that could result in the panels not being able to charge them fully, which in turn could result in early battery death. I read a great quote online about this: "Most batteries do not die of natural causes, most of them are murdered." So then I'd need another panel (plus expensive cabling) at $150+, which the controller is rated to handle. To go beyond that, I'd need a bigger charge controller. And to power bigger devices, I'd need a bigger inverter at a couple hundred bucks more. It can go on and on, so we try to keep it all in check if we can. So that's it, over a grand of real money, ouch. The only thing that's optional there is the $20 measurement circuit but I don't really consider that optional since it helps me protect the batteries. There is no automatic shut-off for low battery voltage (which would reduce the battery life), but I suppose I could add something. The measurement circuit will "alarm" when the battery is below a set-point (I set it at 12.0V). But it's "alarm" feature just flashes the backlight on the display which won't exactly wake me up at night! The only time that would be an issue is when we're running a fan all night. My solution is to experiment with running it during waking hours and noting the battery voltage vs. the time the fan is running. But I don't want to run the batteries all the way down during the experiment because I never know when the power is going off, it's a Catch-22! For this money, we get something that removes so much of the stress of not knowing how long the power will be out “this time”. We've heard other islanders talking about being up all night waiting for the power to come back (I know, I know, what the...?). Of course we're sleeping at night, not stressing like that, but this gives us peace of mind during the waking hours for sure. And once the power bills come, we will start to recoup the investment little by little. And as I said, every time the power kicks off we think it's worth it. We think of it as the cost of paradise. Super cool. I hope this post helps others in similar situations! Have you talked about it with other islanders? I’m going to post a little on one of the local forums and see if there is any interest. I would like to help people but most of them don’t have the money for it. You are right about it being technical. I hardly understand any of it but glad I have children smarter than me! Anyhow, so glad you got it working and hope you won’t need it very often. Are there similar systems on the island? If not, maybe you could start a charitable org teaching others how to set them up. Or, maybe you would rather listen to the sound of sunshine. The sound of sunshine is nice, that’s for sure! There are other solar installations on the island but the only ones I know about are big, for running a whole big fancy house, or huge, for running the hospital for example. But as I mentioned above, a lot of it comes down to having the cash up front, and many don’t have that. Or, they don’t really want a hybrid system like this that doesn’t solve all their power troubles. But then they are bumped up into the multiple thousands of dollars. Great post! Really pretty basic math. 80:20 rule keeps it very simple. 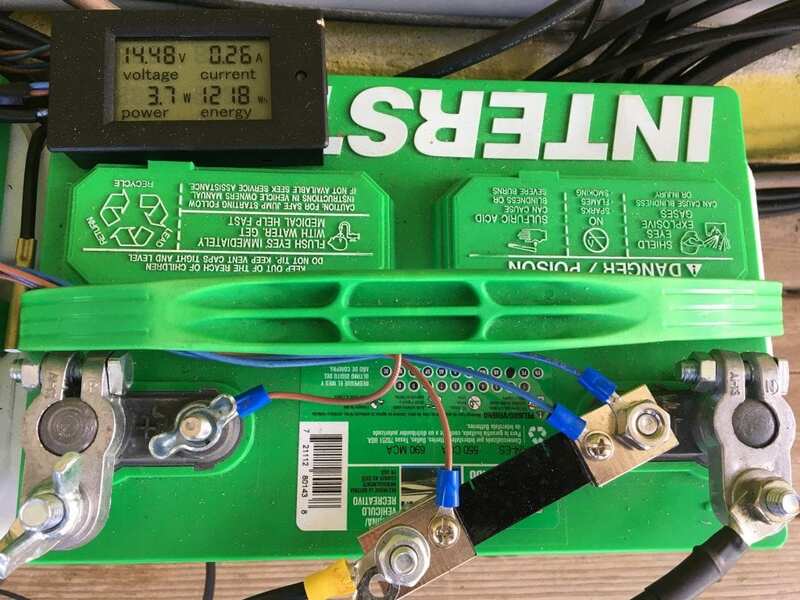 I never thought of mismatched batteries having to be discharged to identical voltages, to prevent huge current spikes while first connecting. Thanks for demystifying the system! Thanks Kevlar! I didn’t think about the voltage mismatch either, until a few minutes before I was going to hook them up, but I’m glad I did. These marine batteries are a hybrid and do have the ability to provide a lot of amps all at once, not as good as a car battery but close. I didn’t want to find out the hard way what would happen if they were a half volt apart. There are trade-offs with lead-acid storage technologies. As my physics professor would say, “imagine an infinite plane of …” – in this case, electron-producing sites. You get, at most, two electrons per atom of lead, because physics. Some electron sites react at 13 volts, others at 12.9 volts, and so on. The 13-volt sites get used most often, so they tend to wear out (sulfate) first. Engineers can tune the infinite plane to produce electrons quickly (car starting batteries), or to produce more electrons overall (golf cart batteries). 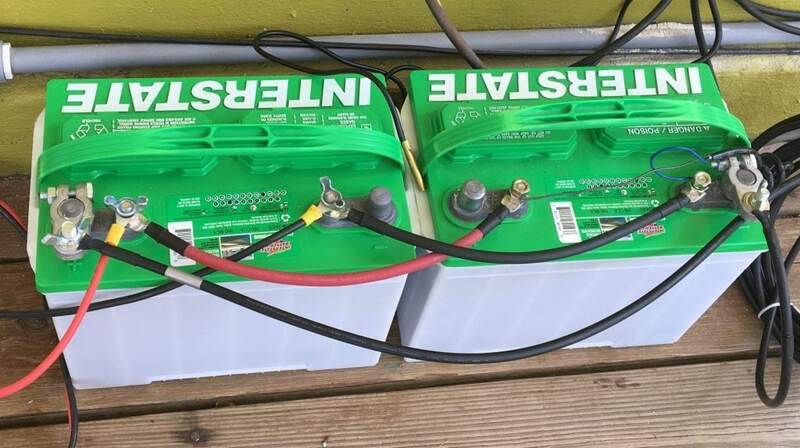 Marine batteries are somewhere in-between, and a good choice for Vieques. Starting batteries maximize lead-acid surface area. Golf cart batteries fill those surfaces with lead (+2 electrons.) One of the Wildwind owners has contacts in the mining industry, which is required by law to periodically replace their “golf cart” batteries. We haven’t found a cheaper source in Colorado. When putting two batteries in parallel, the infinite planes of electron sites are doubled. (If you grok 2 x infinity, good for you.) Your instinct to equalize the plate voltages before bridging them was a good idea. By buying two batteries, you likely got the same manufacturing lot, and the two infinite planes are chemically near-identical. Good description of the different battery constructions. Good for me at least, I’m sure my Mom won’t like it, LOL! Norm – so glad you paid extra for a “pure sine wave” inverter rather than a “modified sine wave.” I was hardly sleeping at night worried sick that you were going with modified sine wave. ⚡️? You think you weren’t sleeping, how about me? The modified sine wave, well, shudder… HAHAHAHAAAAA!!!! Norm – great post. Mid way I thought the internet had skipped a beat and I was reading Mark Watney describing setting up his solar panels on Mars to power his rover. Pretty similar, and I think you could handle Mars with just a small correction factor for Mars solar gain vs. Earth solar gain. Mark used decaying plutonium though for head. I don’t recommend you and Deb go that way. Plutonium was for heat, not head. Sorry! I see a retirement business developing!!! EVERYBODY wants me to get a job! No thanks, haha! The key to retirement is resisting the impulse to develop a new business. If you must, tell a local citizen about the business opportunity. Oh. And after informing the local citizen, then go to the beach. Haha, that’s a good idea! Maybe one day I’ll quit being a bum and get a job but not for a while at least, if ever! Just getting caught up on kneedeepinit. A few blog posts ago, you bought all of the “old beer” on the island. Thanks for taking one for The Team! You can’t really go wrong with old IPA. Otherwise, a few comments from a captain of houseboat Wildwind, Bullfrog Bay, Lake Powell, Utah. Wildwind is totally off-grid and ventures into the wilderness every week during summer. Good job on identifying requirements. My former manager (Rick Gardner) would have insisted on an Risk Priority Number for each appliance. i.e., “what bad thing happens if X doesn’t work”, and “what can mitigate if X doesn’t work?”. On Wildwind, the Good Crew quickly identified Morning Coffee For The Captain as a “must have” requirement, otherwise the Captain is Grumpy. (I have a Good Crew.) However, the coffee pot requires 600W for about 0.5 hours. Also, the freezer/refrigerator must run overnight, or the Captain’s (and Crews’) steak will spoil. Therefore, The Crew told the Captain the night before that he must run the 10KW generator – to fulfill both objectives. The Captain agreed, and all was right on good ship Wildwind. However, the Captain is reduced to looking at the d*mn battery monitor for most of the trip. We become part of the control loop, because, well, you can’t control the sun. The Good Crew also discovered that, if the battery voltage was low, they could heat water on the propane stove, then pour the boiling water into the coffee maker – a mitigating strategy! The Captain was pleased by the Crew’s resourcefulness. That afternoon’s grog ration was doubled. Second. I’m going to disagree with PaulB, which always dangerous. A solar system is composed of various technologies, including those predicted by Moore’s Law, but also those dealing with batteries (lead-acid, which has not changed much in 100 years) and solar cells (which change more slowly than Moore’s.) I will argue the real limiter is the storage – lead acid – and not the solar panels. Just look at your receipts. Incidentally, I really grooved on your analysis. Spot on. The managerial lobotomy did not take as much brain tissue as you thought. Thanks Cap’n Perry, for all the good and funny comments! I came late to the game about the back and forth of how many batteries vs. how many panels. It came to me when reading a forum on the subject where some guy was having problems, he had way too many batteries for his panels. The learned experts on the forum told him he was trickle charging his batteries to death and that stuck in my head because you know, bad batteries = money out of my pocket. I see how it all works now. United States copyright law allows limited use of copyrighted material without requiring permission from the rights holders, such as for commentary, criticism, news reporting, research, teaching or scholarship. You may link to this site, and to my writing, but otherwise I reserve all rights to this original material. Do you know how much of Vieques’s power was supplied by the under water cables from PR that were severed? Did they ever find out why they were cut? ALL of the power for Vieques was suppled by that cable, if I recall it is around 9 MW delivered. The latest word is that the substation was somehow damaged (not the cable), but again very few details on that. But we were also told that they don’t want to build a secure substation and reconnect because we are on a non-standard voltage or something like that. I’m not surprised, the entirety of PR doesn’t really comply with U.S. standards. 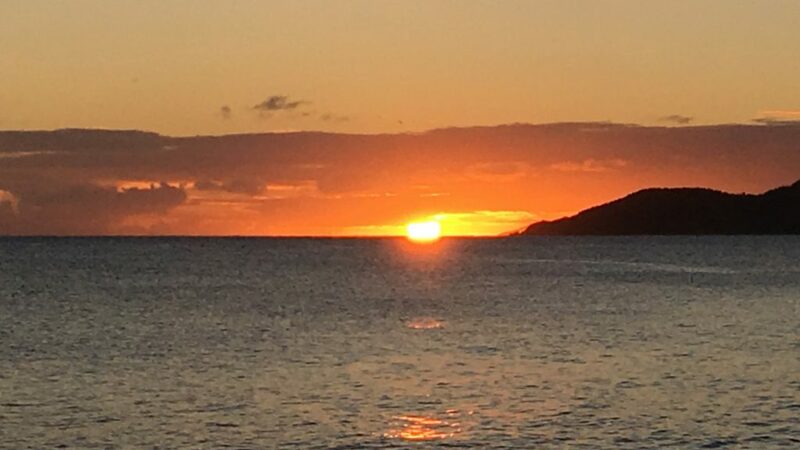 And in even later news, they have announced that Vieques and Culebra will be at the forefront of micro-grids here in PR, and separate from the unstable PR grid. It will be done with I think all solar (my guess) and batteries, and be hurricane proofed. Modern modern! And it will be done in about 2 years instead of 4,5,6 which is what we were hearing only a month ago. Fingers crossed, which is all we can do at this point!